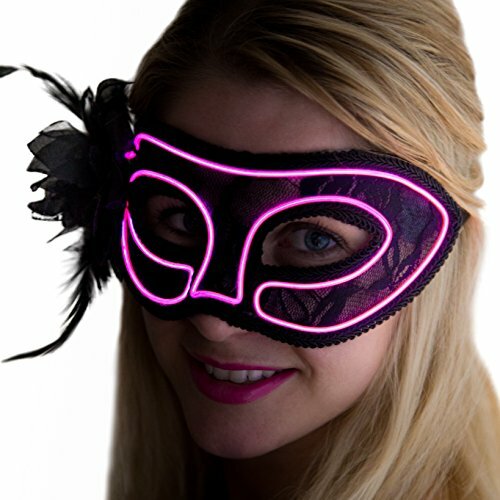 Rock this glowing venetian mask at a masquerade, club, bar, party, concert, rave, or Mardi Gras. Want to stick out from the crowd? It’s the very best ice breaker for singles. Irrespective of where you are You’ll be able to be getting tons of attention from others who are curious about your beautiful neon accessory. It’s definitely an eye catcher and will get you the celebrity style attention you desire at your next event, party, rave or club. Use the flash mode when you wish to have to get a busy bar tenders attention and You’ll be able to find that you’ve got your drink before everyone else. Trouble flagging down that late night taxi? You’ll be able to be noticed with this mask. This is a venetian mask with a black lace front cover. The mask includes a ribbon tie to allow it to fit safe around your head. There are openings for the eyes. Each mask comes with a battery pack with a button that controls 4 modes (off, constant on, slow flicker, fast flicker). The mask has a 4 foot wire coming off the right hand side and runs to a small battery pack. Usually, you’d run the wire under/through your wardrobe and place the battery pack in your pants/shorts pocket. The small battery pack uses two AA batteries (not included) and lasts over 24 hours of continuous use. Please note that all glow wire battery packs in the industry make a slight high pitched tone and this is normal. Because of this, we’ve found that it is best to place the battery pack in your pants/shorts pocket to muffle the sound. We offer a 90 day warranty on the product. If for any reason the mask breaks under normal usage, we will be able to replace it within 90 days. This is the perfect mask for your Party,Carnival,Halloween and more.Awesome for your enjoy. Comfortable fits conforms to your face.The mask control have 4 modes:steady light,slow flash,fast flash,off. Clip the power pack to your pocket or onto your clothing. Takes two AA batteries (not included).